March 2014: Controversy & Celebration! MARCH BRINGS REMINDERS OF HISTORICAL CONTROVERSY & CELEBRATION! What is your opinion on the Boston Massacre? The Boston Massacre was a street fight that occurred over two hundred years ago, on March 5, 1770. The fight started between a “patriot” mob, throwing snowballs, sticks, and stones at a squad of British soldiers. At the end of that night, three men lay dead and two more were dying. This scene came after months of feuding between Bostonians and the soldiers sent to the city to protect the Customs commissioners. The ever present troops in Boston took away the colonists’ rights as individuals and in this atmosphere trouble was inevitable. It lead to many confrontations which ended in fatalities. 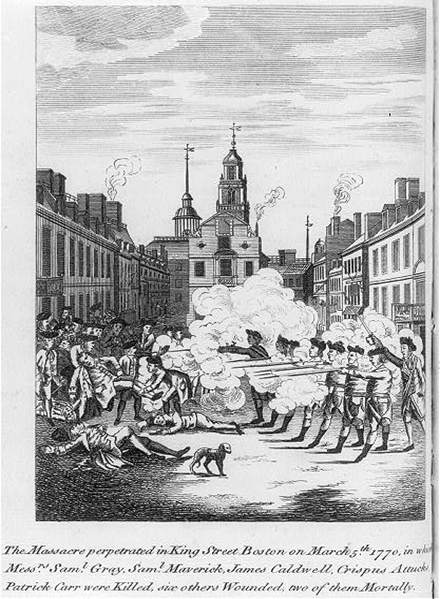 The Boston Massacre deepened American distrust of the British military presence in the colonies. CSI: Boston– reconstruct the scene of the crime at the Boston Massacre. St. Patrick’s Day is March 17th and quite a celebration in the Chicago Area! But that is not the only place that celebrates. The holiday originated as a celebration of a well recognized patron saint of Ireland, Saint Patrick, to commemorate his death. Search St. Patrick’s Day on the Library of Congress and find numerous photos to begin your own primary source set. When did you take the graduate course, Digital Primary Sources, at GSU, and what lesson plan did you design? (provide link to lesson plan as well) I took the course in Fall 2010 in Manteno – it was an “all Manteno” group. My project was Student Inquiry Into World War II. Please tell me how you implemented this lesson plan in your classroom. I’ve implemented it for the last three years, and I used each of the three years to build background knowledge for (prior to) our unit on Reading Informational Text and the study of the Holocaust. It’s a tough subject for 8th graders, but we explain that we want them to be aware of what happened so in the future we (as world citizens) won’t make the same mistake.The lesson is set it up to differentiate instruction as the activities are sorted into higher level reading, group activities, and at-grade-level activities. Each individual student is assigned by distinctive flag designs so they aren’t aware of the differentiation, but the teacher knows they are making each individual assignment for the students. What has brought you the most value from TPS-GSU professional development programs? There are two pieces to this. I thought it was such a great investment of my time, because it is a lot of professional development time to dedicate to it, but I felt my students were benefiting so much that I convinced teachers at my son’s school to take the course. First, I convinced the principal of the benefits of Teaching With Primary Sources from the Library of Congress, then I went in and met with some of the teachers. We offered the course right there on site at the end of the 2012 school year. I found it to be such a valuable resource, that I want other teachers to know about it, too. Anyone who will listen, I will tell them about it! The second piece was the opportunity Dr. Brown gave us to work with the University of Wisconsin – Madison and the ARIS computer games on the iPad. That opened so many opportunities for me, and I feel that is something I would never have known about without my involvement in TPS-GSU. What inspired you to want to become an educator? Education is my second career, but I’ve always loved it … both my mom and dad were educators. I always played teacher when I was little. When I went to college, I majored in business because there was an overflow of teachers … there was no demand for teachers at that time. Later in my life, once the computer software industry took a dive, I turned back to my first career love – education. I’ve never been happier. What do you enjoy most about being a teacher now? I enjoy working with the struggling readers. I love to see them “get it!” I love for them to find something that is their strength and then to “go with it” and build their confidence. Are there any recent achievements you would like to tell us about? This week, my students are working on a historical narrative writing assignment. We’re accomplishing it through ARIS (Augmented Reality Interactive Storytelling). They are creating computer games to teach a topic in history of their choice with dialogue that is historically accurate becoming the basis of their game. On the personal side, Dr. Brown has given our family (both me and my son, Erik) some very rewarding opportunities with ARIS. Just last month, Erik presented at the Students In Technology Conference. That was an exciting opportunity, and neither he nor I would have had this without the TPS-GSU program and Dr. Brown affording us these opportunities through my participation as a Trainer. Please tell me about yourself and your family. I teach 8th grade language arts in Manteno, IL. My entire teaching career has been at Manteno (District) and this is my 9th year. As for my education, I first attended Eastern Illinois University in Charleston, IL – that was for my business degree. Then my Masters in Teaching is from Chicago State University. For fun, I skate on an adult synchronized ice-skating team. I also volunteer with the Boy Scouts and at my church, and support my son in his multiple activities. My husband, Bob, works for Morton Salt. His hobby is music – he plays keyboards in a band, a mix of classic rock & southern rock. My son, Erik, is age 14 in 8th grade. His hobby is fencing. Erik is also active in choir and he is currently performing in the spring musical at school. In fact, just this week, The Hickory Creek Middle School Choir won first place in their district competition. He also traveled with the TPS-GSU Team to the ISTE Conference last summer, and he was one of the students attending with our Team who presented the ARIS game design session.